We follow on from our earlier outlook piece and drill down into Chemicals, where it is hard to find larger cap “value” today – LYB the only real exception in our view. 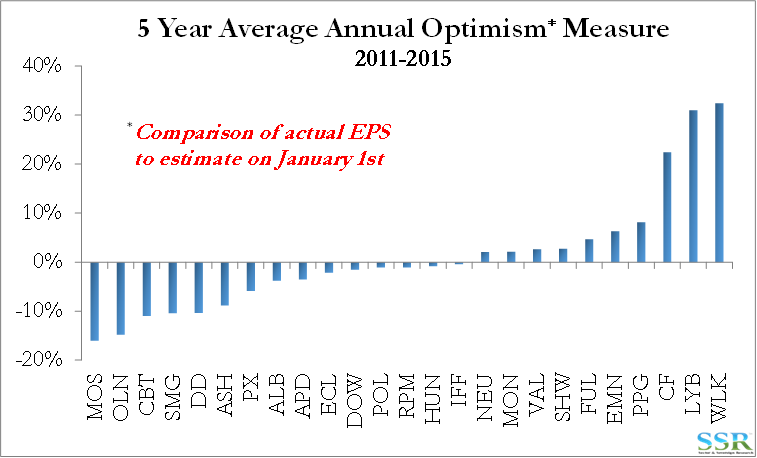 We still like the DOW/DD deal – see recent research – but the deal needs to close! If the DOW/DD deal closes then it is likely that MON/Bayer will – so MON has upside. Other long ideas are generally smaller cap and very dependent on trends in pricing seen in the second half of 2016 around Urea, TiO2, Caustic Soda, China Coal etc. IF we continue to see more limited surpluses in China, because of local demand growth or supply restrictions, CF, WLK, OLN and the TiO2 names could continue to do well. Conversely, a reversal from China sets up for some disappointments near-term, but probably adds fuel to some of the predatory trade issues that the Trump Administration will address. Rallies at CF, HUN and OLN could reverse quickly if Chinese exports rise and while we have no data to suggest that yet, stories of rising iron ore and aluminum surpluses are circulating. On the negative side, the companies with the worst price momentum today are those we continue to see risks in for 2017. We are very cautious on the paint and coatings market as we see end markets peaking – price competition rising and (particularly for SHW) valuations high. We like Akzo. The dollar is going to hurt PPG and despite its discount to SHW we see no reason to buy. We are also cautious on the Industrial Gas market – see recent research – and do not expect either PX or APD to perform well in 2017 – strong preference for Air Liquide. 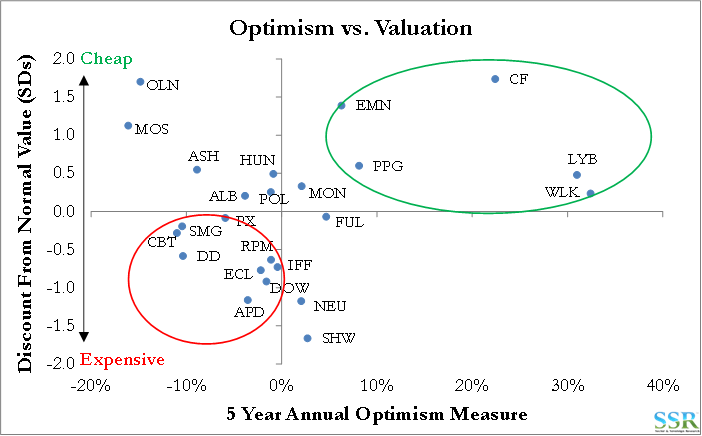 “Optimism” addresses capital allocation decisions; identifying companies that are consistently optimistic in guidance and tend to underperform as a result. The overall trend for the chemical group looks very concerning right now and points to another poor year for the group from a revisions perspective. Dow is bucking that trend and is showing a much more pragmatic approach to guidance. 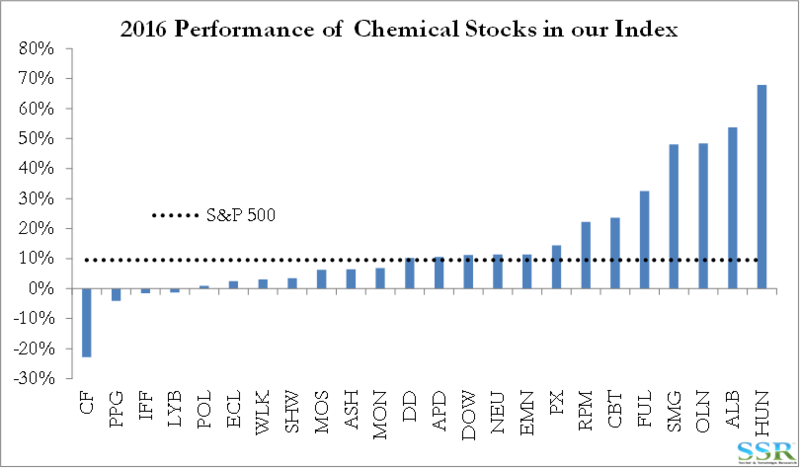 With the exception of LYB, we do not like any of the large cap names in US chemicals when looking at fundamentals and valuation combined – DOW/DD work if the deal goes through. Europe looks more interesting: we like Air Liquide, Akzo and perhaps BASF vs US names. Earlier this week we published a sector overview using the valuation and other stock selection tools that we have developed over many years, to suggest sector weightings across Industrials and Materials. Chemicals was in the middle of the pack and would not be a preferred overweight or underweight for us in 2017 as a consequence. 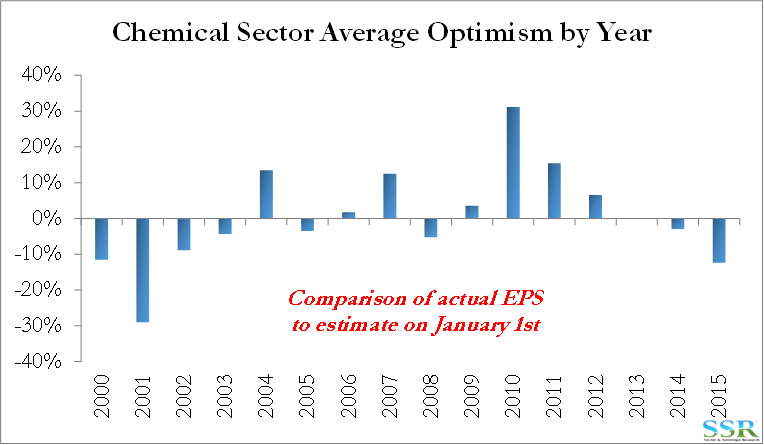 On a cap-weighted basis our universe of chemical companies underperformed the S&P500 in 2016, although there were some smaller cap outliers that did very well in the “deep value” category, SMG responded very well to its move into hydroponics and ALB benefited from its move to focus on lithium as well as the momentum in that market – Exhibit 2. While we regularly comment on CC, VSM, TSE, TROX, ASIX, and others, they are excluded from our index because of limited history – and we need history to construct many of our tools. Taking our methodologies and factors a stage further and simply registering how many times a company appears in the table in Exhibit 1; +1 for the top half and -1 for the bottom half, we get the following ranking – Exhibit 3. Note that MON, FUL and VAL do not appear on any of the lists. 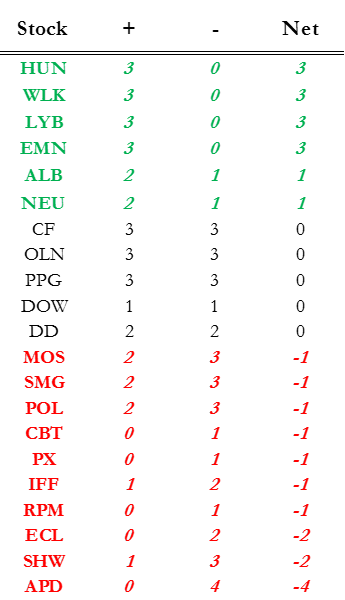 Other than NEU, which has been a momentum play for years now, the rest of the table lines up approximately with our thinking in the space. We are more positive on the polyethylene cycle – WLK and LYB (and DOW). We have been quite positive on CF, but it is unclear how much more upside there is in Urea pricing before we begin to see more supply. Most of the easy gains are probably behind us now. The stock still looks very inexpensive on a normalized basis, but it is questionable how long it will be before Chinese exporters allow us back to a normal environment. EMN continues to screen as attractive, but it has done so now for 2 years and disappointed many times. There is significant opportunity in this stock, (in our view) but it is unclear what the catalyst will be. If HUN can exit TiO2 during what we think is likely to be a brief recovery in pricing, then the stock could continue to do well. ALB is now a focused play on what has become a very strong lithium market. While capacity is being added around the world, with the Tesla battery factory starting operation this week, there could be further to go. The stocks with zeros have just as many upside indicators as downside. We like DD and DOW because of the deal and would note that the cost initiatives at both companies probably make history a less useful predictor of the future. PPG does not fare well on the momentum side, given negative guidance and we would also be concerned about its new large Mexico presence given the incoming administration’s negative stance on investment in Mexico and possible consequences for economic growth and exchange rates. 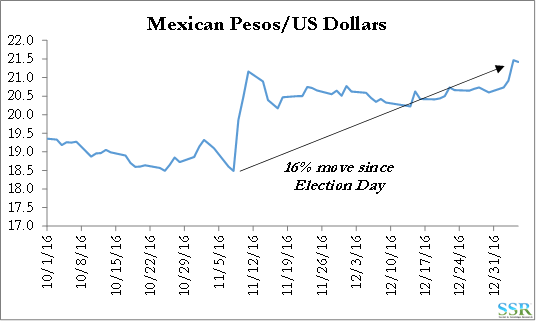 As shown in Exhibit 4, the Peso rate has not reacted well to the US election. We have written cautiously on the Industrial Gas space (in the US) and on Coatings (in the US) in recent months. 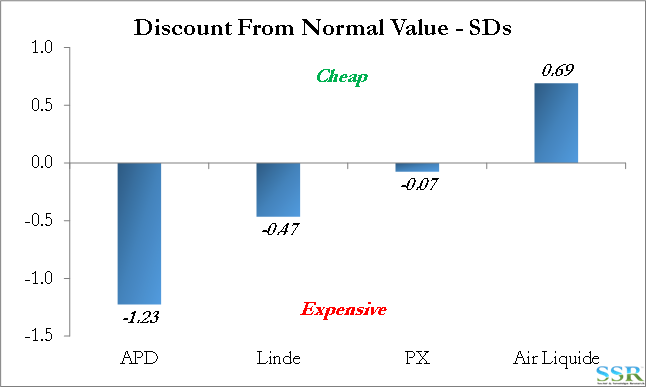 RPM’s significant miss on the back of PPG’s negative guidance suggest that our coatings concerns have some legs – SHW is the valuation outlier with the most downside. 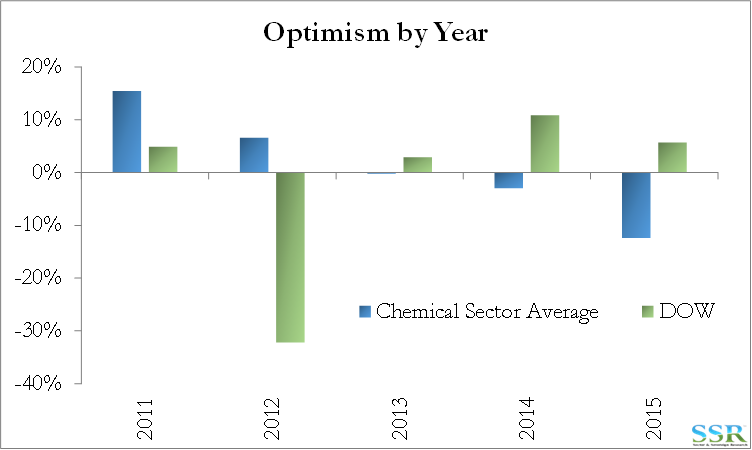 While a number of companies in the chemical space screen very well on our optimism framework, especially WLK and LYB – Exhibit 5 – many do not, and the industry average has been declining steadily since 2011 and in 2015 was the lowest in recent history (Exhibit 6), suggesting that either optimism is increasing (a bad thing) or fundamentals are on a deteriorating trend line that few recognize. In Exhibit 7 we show the “cheap” conservative companies and the “expensive” optimists, but we have seen that governance and management changes can improve or undermine past performance. Both DOW and DD are seeing current market guidance and expectations that are much more in line with a conservative approach to planning (shown for DOW in Exhibit 8). At the same time we are concerned about recent news flow from PPG. Perhaps the data points in Exhibit 7 would be more helpful if there was a directional arrow – where appropriate – on the conservative to optimist continuum. We would have right pointing arrows on DD and DOW and a left pointing arrow on PPG, SHW and probably now RPM were this the case. In 2016 we started to stray outside the US and have written on BASF, Akzo, Air Liquide and Linde so far (we have also discussed Bayer in the context of the MON deal). Our valuation models would suggest that Akzo has a PPG like break-up story which could generate significant shareholder value and Akzo would be our preferred way to play coatings given valuations in the US and peaking auto markets and US housing markets. In the industrial gas space, Air Liquide looks by far the most interesting company today – not just because of valuation (Exhibit 9), but also because it has a real growth story with its Airgas acquisition in the US. 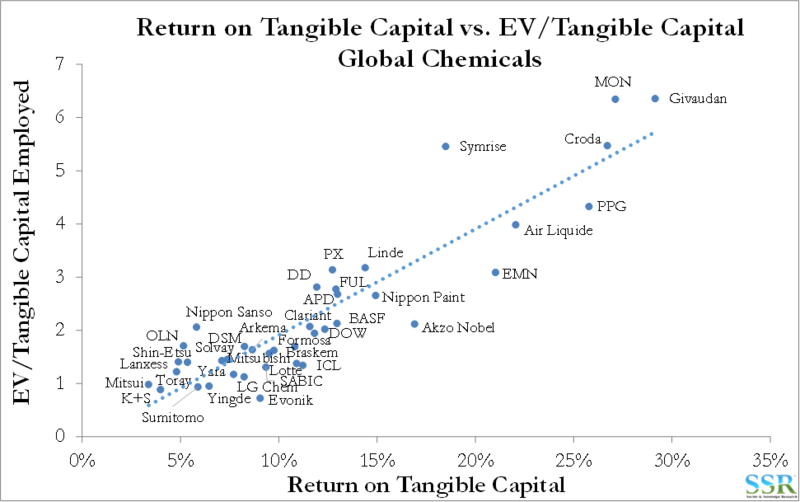 While we do not yet have normalized models for the rest of the global Chemical group we do have return on capital based valuation models – Exhibit 10. Generally, we are looking for companies below the trend line, but direction is important and we would adjust trajectories for those companies involved in large M&A.